In the past, when we referred to the four “P”of the mix of marketing, we tried to translate to “praça”[market] what in English is placement, in reality it is something more like the “placing” of products and services or making them “available” to the consumer. tool for the shopper and the Customer Service Inquiries a marketing and fidelity tool for the consumer. Take the example of the beverage industry, in which the fragmentation of the product into more than one million points-of-sale in Brazil makes it the category with the greatest retail penetration among consumer goods. The penetration in retail is what allows it easy access to households, which in turn expand the consumption and consequently the market share of whoever works their channels best. But who looks after the channel strategy of your business? In general the sales area is the area responsible for defining the channels through which the products will reach the shopper and consumer. It is the responsibility of Sales to “open new client accounts” and discover new distributors in regions that are still not attended. But what does this mean for the business from the strategic point of view? I mean, what does it mean to have the Sales Dept. as a guardian of the channels of the business? It means that the more they are pressured for results in the short term, the more the salespeople and regional managers are going to make the channel strategy “flexible” in order to reach their targets. This autonomy for making decisions in a decentralized and very often a discoordinated way about the marketing channels of the company ends up creating conflictive situations between intermediaries, or a price war between retailers. We analyzed the case of Louis Vuitton. They do not sell their products in the famous American discount “outlets”, unlike the best part of their direct competitors. This kind of channel strategy is highly efficient in protecting “brand equity” (the value of the brand). The channel strategy is fundamental for guaranteeing the success of the products in the market. I am not saying that some level of conflict between channel members – wholesalers and distributors, for example – is not useful. It is. At times the distributors are so inefficient in attending potential demand from the region they serve, that its is recommendable to stimulate a certain healthy level of conflict to increase the saturation of the market – mainly in cases of low-cost products of low complexity, such as lighters and ball-point pens, for example. territories; a disservice to both the consumer and the State. The channels strategy is a discipline that is generally subject to great attention from the high management – or board of directors. In the majority of consumer-goods companies, the area is led from the intellectual point of view by trade marketing, which looks after the B2B aspect, in other words, the strategic relationship between manufacturer/brand and its distributors, sales representatives or sales staff and retailers. If you don’t belong to the area, you must be asking yourself – at this point – how it is that the channel strategy is made in your company. In some companies the planning for channels is under the responsibility of “sales administration”. This option denotes a more operational approach, in the sense of making the channel “work”, rather than really planning its strategy. In others – the most evolved – apart from trade marketing, which looks after the performance of the brand alongside the shopper at the point-of-sale – there is the figure of “Manager of Channel Development”, a great name for the manager that plans the activity of the areas of Sales and Commerce along with the intermediaries. In beverage, tobacco, potato chip and other such companies where there is a need to increase distribution, this professional is indispensable. The Channel Development Manager works together with the Commercial area establishing the “how”, “where” and “how much” each channel of the company will represent in the difficult task of making the products available in an economically viable way for the intermediaries and the shoppers of the brand. He or she must think about aspects, such as: the operational logistics and taxation. However, it is in the aspects of commercial competitivity and in the business model of the intermediary agents and process facilitators that this manager spends most time. taken in the past. If Subway had decided to sell its products in supermarkets, as Bob’s did, they might have had problems guaranteeing the quality of their products. This is just one of the risks of expansion in channels controlled by third parties. Below, I have presented a schematic model of marketing channels for consumer goods, that was developed by myself in order to facilitate the learning / understanding of my post-graduate students in channel management (it is merely a teaching model) but one which greatly helps us to understand the responsibilities, inputs and results of the work in channel planning. Note how the channel decisions start in the external environment, particularly under the auspices of the competitor. When Chilli Beans started, certainly its largest competitor was Fotóptica and other neighborhood opticians/glasses stores. The company modeled its marketing channel (the stores and kiosks) so that they spoke the same language as their target public and, through this, achieved amazing success, even at an international level. Certainly their marketing area thought as much about their stores as about their products and communication. They understood the weighting of the “channels” variable in their business and were outstanding in innovating both in channels, as well as in products. How do marketing channels work? Basically, there are two types of agents that execute channel strategies: the intermediaries (in a generic way) and the facilitators. Intermediaries are all those agents who are directly involved in the sale or resale of products between companies and consumers. Facilitating agents make things happen, they are the financiers that provide credit for the new car, the transporter that takes the products to the retailer, the “Cielo”s and “Redecard”s of this world, that deal with the means of electronic payment, and so on, and so forth. The intermediaries and facilitators carry out activities related to the marketing mix. These activities are called “flows” because they make up part of a chain of events that culminate with the product being consumed. As one can see, there are several possible activities, of which the most important are the negotiation, the buying, the resale, the stocking, the delivery and the payment. between the product brands. Just look at how many players are involved in the marketing process, after the product leaves the factory! The entire chain must function well, it is no good having a new product that is competitively priced, if retail, for example, is going to mark it up so high that it makes the increase in penetration non-viable beyond the niche and “early adopters”. Truly, the success of the introduction of new products is intimately linked to channel planning. It is not for nothing that more than half of the products launched this year will have failed in such a short time. Apart from differentiating themselves in the POS in the middle of other SKUs, price, promotional support, delivery and ….would you believe it … the stocking of shop shelves are the main causes of the demise of new products. representatives and even company re-stockers. If, on the one hand, too many incentives create the so-called “incentive over incentive” (something that reduces its impact within the channel), on the other, the absence of incentives acts as a barrier. Worse than this, the existence of too much conflict between channels hampers the growth of brands. Conflict is different from competition, which exists between different brands and chains of distinct manufacturers. Conflict is something that happens in-house, and in general, forces members of the channel to spend more than they should, fighting among themselves, when they could be using these valuable resources to directly combat the competition. This becomes more complicated in channel management as it involves commercial contracts with large retail accounts foreseeing redress of losses through “mark-down”; in other words, the lowering of prices to keep up with the other chains. The same happens when it is necessary to administer clauses that foresee processes for falling profits and other questions concerning franchisers or distributors. Many large fast-food chains have had large losses due to this. Finally, the management of channels must seek expansion opportunities in both the actual and new points-of-sale. This process, carried out by the commercial area, should not be too flexible, and could be closely followed with an indicator apparatus that will measure the progress of the plan and its results. Creating the appropriate metrics is the main part of the work of the Channel Development Manager before defending their own projects. sophisticated systems of control of the flow of shoppers, traffic and sales conversions, is worth everything in order to increase the control over the execution on the shop floor. In the end, as the president of a large consumer-goods multinational said: “The execution is the only strategy that the consumer sees” and at the end of the day it is from there that the profit for the shareholders comes. So, now, have you imagined what could change in the “P for placement” of your company? 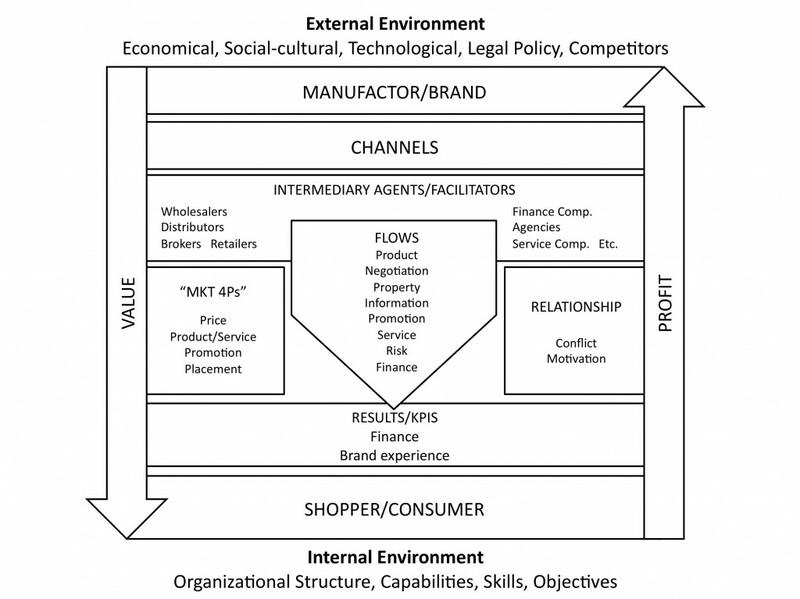 In difference to the consumer-goods area, in service companies, the “P” for channels is normally managed from the strategic point of view for the marketing area, which could be under the responsibilities of the products area, or of the clients/market segment (responsible for a determined group of clients or market segment). Depending on the complexity of the channels used, there could still be the figure of the commercial planning area, generally subordinated to the marketing area, which has, as its mission, to coordinate all the commercial effort and adequate the strategies to the resources, in order to attain the objectives, further being the interface between sales and marketing. Normally it is used in companies that offer massive services, such as telephony, banks, credit cards, among others. The following scheme of working is common: the segment areas detect a determined need upon the part of the clients, whereas the products area develops a product/service for this target. In the client/market segment the commercial policy to be applied to that product/service is defined (price levels and discounts, offers, levels of service, fidelity and retention policies, unit sales or in bundles, etc) and also in which channels it will be commercialized. The sales area (generally call centers, stores or sales personnel) and the technical area (when appropriate, as in telephony, for example) operationalize and tangibilize the delivery of the service. This whole process is retro-fed almost instantaneously. The fact that the marketing area generally defines the mix of channels to be used is important for guaranteeing the correct implementation of the strategy, given that there could be different levels of prices/services, different costs and different levels of risk (churn, bad debt, etc) for each group of clients approached in each channel. implementing a tightly-woven strategy. In such cases, the essential and foremost function of the Sales Area (the call center, in this example) is to guarantee the best sales conversion possible, by means of the perfect dimensioning of the operation, of the application of the correct incentives to salespeople and of the existence of winning sales scripts. In these massive and large scale operations, it is the responsibility of the commercial area to guarantee the maximum efficiency within the entire process, and is, therefore, a vital factor for the success and profitability of the business. Offers directed through email marketing, active telemarketing, sites and social networks, among others, are also commonly used and treated as channels. The working dynamic basically follows the above example, with the policies being defined by the marketing areas and their execution by the commercial and technical areas. Thus, in service companies (mainly massive) it is of fundamental importance that the marketing and commercial areas work both very closely together and further in a coordinated way. As such it is no rare thing to find a certain crossover of professionals between these two areas.